The train has come from Manchester Piccadilly and is running late into Llandudno Junction. So late in fact, that the train I am on from Blaneau Festiniog arrives before it, when it should have left the station already. It is a four-car unit and only half full. It should have left at 09.45, but eventually leaves from platform 3 at 09.54. We go past Llandudno Junction signal box on the right and leave the mainline to Holyhead, going in a northwesterly direction. We go under the A55 and then get spectacular views across the estuary to Conwy and the castle. We travel quite slowly at first, but then speed up past the houses on our right. There are briefly some houses on the left too, but the estuary comes back into view. We stop at Deganwy station, which has its original cast iron footbridge, and just two bus shelters on its platforms. It is in a nice setting though, right next to the estuary, with boats moored up in the sand. We then move away slowly, the track curving to the right and go past a golf course, which is on both sides of the track. We then get a grand view along the North Wales coastline to Holyhead. Next the Great Orme headland looms up on the left and then new housing appears on the left and industrial units on the right. We pass some overgrown sidings on the left and then come into Llandudno station, passing the tall signal box on the left. There are still four platforms, though only three look to be in use, with two more tracks filled in and now used as a roadway. Ours is the only train in the station, but shortly before this train leaves as the 10.10 to Llandudno Junction, the train I was on from Blaneau Festiniog comes in. I doubt whether I would have had time to rush round the platform to catch this one. 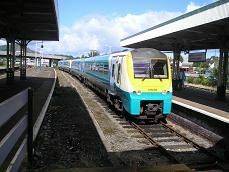 It then returns as far as Llandudno Junction, coming to stop in platform 2 bay platform.